Find out what our brisket beef jerky looks and tastes like – B.U.L.K Beef Jerky - The Best Jerky in the USA. We wanted to take a moment and tell you a little bit more about our Brisket Beef Beef Jerky. Here is a quick video about them. Do you make them in small batches? For now, that is how we are going to keep it. Our Brisket Beef Jerkies are handcrafted and made in the USA. We believe in quality over quantity, which means you are guaranteed fresh jerky every time. It comes from the front of the cow, it's soft and tender which makes it very easy to chew on. How long do you marinate your Brisket beef jerkies? We marinate all of our Briskets up to 24 hours before we smoke them. All of these brisket jerkies are our very own recipes. Also, Briskets are naturally sweet, therefore we only add a little sugar to keep the soft & tender texture you enjoy. 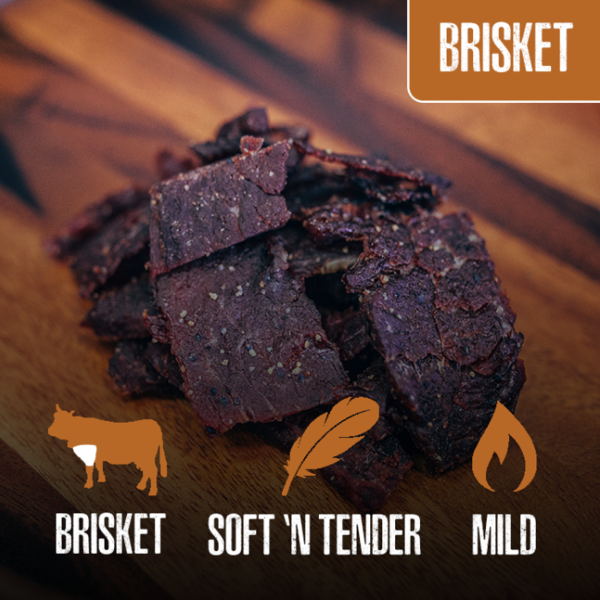 Click here to find out more about Brisket beef jerky.